We want to be your Myrtle Beach Real Estate Resource! This section is a mixture of our newest listings, real estate news and some of the testimonials and accolades that our agents have received from satisfied clients. Please reach out if you have any questions. We'd love to talk with you! It's finally time to retire and move somewhere warmer. You've thought about Florida, but you're not really attracted to the hot and sticky summers that become almost unbearable. You've considered somewhere southwest, but it's just not the right fit for you. Maybe Myrtle Beach is your great compromise and provides the perfect choice. Beautiful beaches, plenty of things to do, and a great climate filled with sunshine and bearable temperatures most of the year might be just what you're looking for. Here are seven of the top benefits you'll gain if you retire to Myrtle Beach. One of the major drivers of the decision to retire to a specific location is the climate. Myrtle Beach gets more than 200 sunny days per year and the average temperature is about 74 degrees. The winter isn't quite as warm, but average temperatures still float between 55 and 60 degrees, so no more shoveling snow. If you're hoping for a great destination for golf, Myrtle Beach should be tops on the list. With more than 100 golf courses in the area, Myrtle Beach is known as one of the major Golf Capitals in the world. All the golf courses are open year-round and you can even enjoy 30 mini golf courses. Myrtle Beach also attracts several golf tournaments throughout the year you can attend. The cost of living in Myrtle Beach is lower than many other top retirement destinations. It's lower than the US average for housing and transportation, as well. The lower cost of living can be a huge benefit for those retiring to the area. Of course, the beaches are a huge draw for retirees and a major benefit. 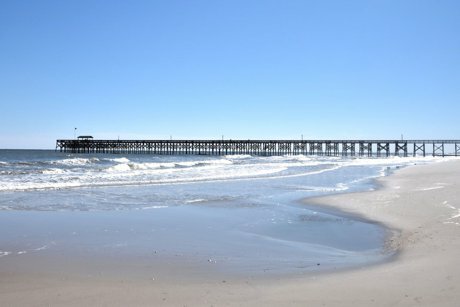 The Grand Strand is found here and provides 60 miles of beaches through Myrtle Beach. There are plenty of choices and the beaches are beautiful here. Retirees often want to have a home base and do some traveling. Myrtle Beach provides an airport with services including Delta, United, and American Airlines. They also have regional options, such as Porter, Spirit, and Allegiant. It's easy to travel from Myrtle Beach by airplane or by car. Myrtle Beach offers plenty of activities for retirees to enjoy including tennis, biking, golf, and more. There are plenty of things to do all throughout the area. The annual events include plenty of great options, such as the Blue Crab Festival and Oktoberfest. There are several concert series throughout the summer and plenty of holiday events every year, as well. With plenty of shopping throughout the area including the Tanger Outlets and Coastal Grand Mall, you'll never have to worry. Myrtle Beach also offers incredible dining with restaurants ranging from casual to fine dining all throughout the area. Myrtle Beach offers plenty of great benefits for those looking to retire. Unlike Florida and Arizona, you don't have to escape the heat of summer to head back north. Sure, it's warmer in the summer, but most retirees find it bearable enough to stay year-round. For Sale By Owner seems attractive as you'd likely choose this option to save the real estate agent commission. Sometimes, it's the right decision, but more often than not, it's more hassle than you bargained for. Here are five good reasons you shouldn't try to sell your home on your own. Sure, it seems easy to figure out how much to sell your home for, but it's not. You have to have a good knowledge of the current real estate market in your area. Then, you have to have access to similar homes that sold in the area recently. Finally, you have to make adjustments based on the uniqueness, condition, and differences of your home compared to the others that sold recently. It's an art form real estate agents are very good at and the price is probably the most important factor in selling your home. Get the listing price right and you'll be flooded with interest. Price the property too high or too low and you may struggle to get serious buyers interested in making an offer. When you choose the For Sale By Owner route, you'll quickly find getting exposure is difficult. Placing a sign in the yard and an ad on Craigslist isn't enough. It's a start, but you also need to place ads on the Facebook Marketplace, in the local newspaper, and anywhere else you can find. In addition, these ads need to be updated weekly and you still won't get a ton of exposure. Even getting your property on the MLS isn't going to give you massive exposure as every property is found online these days. You need something different to get exposure and you probably don't have the huge network of potential buyers a real estate agent has built up over the past decade. Exposure sells homes when everything else is right. If you cannot get exposure, you'll be hoping for a bit of luck to get your home sold on your own. Have you ever gone through the contracts involved in selling a home? Do you understand the contingencies of a home offer? Are you prepared to close on your home without making any major mistakes? The paperwork in a home sale isn't just complicated, but it's time-consuming to complete and understand. Real estate agents deal with the paperwork every day and have been trained to fill it out correctly. They know what to do and if you don't, the paperwork alone could be too much for you to handle. Yes, you can search online for tips to prepare your home for sale and even hire a stager, if you're willing to spend a few thousand dollars. However, you'll likely end up with a home not well prepared to be sold. When you have a showing, the home may not show well due to the fact that it wasn't properly prepared. Remember, buyers have probably looked at several homes and may have walked through more than one that was professionally cleaned, staged, and well prepared for sale. If you cannot measure up, why should they even consider your home? For Sale By Owner properties, on average, take longer to sell. When an agent can step in, reach out to their network of interested buyers, and prepare the home for sale properly, they can get it sold faster. If you don't want your home sitting on the market for months, you may not want to try to sell it on your own. Selling a home is a huge endeavor and for many, it will become a full-time job, if they do everything necessary to get it sold. Hiring an agent takes this weight off your shoulders and makes selling your home easier, faster, and often worth more. Selling your property on your own isn't easy and many sellers start with the FSBO route. It's possible you've been through this process and even seen a few contracts fall through before closing. Here are some of the answers to some of the most common questions when selling FSBO. Once you decide to sell your property on your own, you'll likely get plenty of communication from real estate agents. Most of this communication will be agents looking for a listing. Many of the agents calling you probably haven't even researched the property. They may not even know where the property is located. Many sellers considering the FSBO route are not sure if they can be successful. It's very possible to be successful when selling your property on your own. About 10 to 12% of FSBO properties are actually sold by the owner without an agent's help. In order to find success when going the FSBO route, you really need to know what the 10 to 12% are doing. Check out the next post/video and find out what successful FSBO sellers are doing to find success in the real estate market. After several questions, it was necessary to do a video about the compound effect of marketing. It has been mentioned in several other videos and it can be a bit confusing. The compound effect includes marketing a number of properties over a long period of time. It's easier to understand when looking at a comparison between someone selling a few hundred properties a year compared to someone selling just a few properties. Let's look at someone selling on their own that's going a bit overboard and overachieving with their marketing plan. They will obviously have a sign in the yard, but that's just the beginning. This person would also be posting an ad on Craigslist and the Facebook Marketplace. They will likely post on NextDoor and also in any groups they may be a part of within the community, such as church groups, book clubs, golf leagues, etc. This person may have even gone as far as sending out an email to their centers of influence (people they know within the community) to let them know their home is for sale. They may even go a step further and optimize their profiles on Zillow, Trulia, and Realtor.com. Maybe they have even gone as far as doing a video tour of the property including shots from a drone. This overachiever may even go as far as refreshing these profiles, ads, and marketing methods once a week to keep them current. They certainly have quite a bit of marketing out there for their one property. This is an example of an over-the-top marketing plan for one property sold by one person. Most sellers won't go this far. Most people selling on their own will put a sign in the yard and take out a couple ads, but that's about all they do. This example, however, is pretty aggressive for someone selling on their own without the resources of a professional real estate agent. In this example, you're selling one property every couple of years, at most, because it's your own property. Over time, there's no build up from the marketing you're doing for that one property. There's no compound effect from your marketing efforts and no database of buyers being created due to your marketing plan. It's also unlikely that you would set up funnel systems for those expressing interest in your property, but not showing up or making an offer. While all the marketing methods in this example are good, they are just one-off activities used to sell your property once. When you hire a professional marketing agent to market your property, you get the compound effect. They will do many of the things mentioned in the first example and more, but it's done with every single property on a day in and day out basis. This creates the compound effect. When an agent markets like this, they capture buyer leads from various properties and build a database of interested buyers to market to over and over again. This allows a good agent to follow a lead from someone that's just looking to someone ready to buy. Over time, these systems are refreshed and maintained. This would be far more than a full-time job for a for sale by owner person and require a staff. This wouldn't make any sense for a single for sale by owner seller, but for an agent, it makes perfect sense. The compound effect of marketing allows for a higher return on your property's sale. This is due to the marketing done over time, the database built by a good agent, and the staff they have to market your property in the most aggressive way possible. The compound effect of marketing over time can be very powerful and can make it easier to sell your property. This effect allows an agent to become well-known within the right circles in their community, as well. If you're looking for the most powerful marketing possible, choosing an agent that markets hundreds of properties is a great way to put the compound effect to work for you. Is a Professional Photographer Necessary? Should You Hire a Professional Photographer When Selling Your Home in Myrtle Beach? Selling your Myrtle Beach home isn't easy. The right tools make it easier and allow you to sell for the right price. With so many people starting their home search online, your listing pictures are vital to achieving a successful sale. Myrtle Beach is a unique community drawing interest from all over the globe. Buyers come from the north to retire or in search of a warmer place to live. Some buyers even come from overseas. When buyers are hundreds of miles away from the place they want to relocate to, listing pictures become their go-to when searching for a home. They are only searching online since they cannot be there in person. If you don't show off your property in the best possible way, you could end up losing out on these potential buyers. Do Professional Images Make a Difference? When a home is properly stages and well photographed, it becomes a prime listing ready to be sold. From the buyer's perspective, seeing amazing pictures that look like they could be in a magazine may be reason enough to give your property a closer look. Without great listing pictures to draw potential buyers in, you may struggle to get people to look at your online listing. Imagine sifting through hundreds of pictures of homes looking for the perfect one. You're almost looking for a needle in a haystack and the best way to find a needle in a haystack is to make it look bright, shiny, and far more attractive than the hay. The answer to this question is a bit tricky. Professional quality images are 100% necessary to get your Myrtle Beach home sold for the right price. However, a professional photographer isn't always necessary. Some real estate agents have the equipment to take high-quality pictures for you and don't need to hire a professional. However, if they get out their smartphone and start snapping listing pictures, you need to question them. Phones take good pictures these days, but they are not good enough for your listing. If you plan to allow your real estate agent to take your listing pictures, they better have the right equipment. One of the major reasons a professional photographer provides such great images is the equipment they've invested in. High-quality photography equipment costs thousands of dollars and most agents don't make this type of investment in the cameras they use for listing pictures. When you want to sell your Myrtle Beach home, you want to stand out from the crowd. You won't be the only home on the market. You'll be competing with plenty of other properties very similar to yours, but you can still stand out. Professional pictures make your listing pop and make you stand out. Without professional pictures, you may not get the property sold as fast or for the price you want. Hiring a professional to take your listing pictures is an investment as it will likely pay off. A professional photographer will spend hours taking the pictures and editing them to make sure they are the very best representation of your property for sale. Make sure your agent is using a professional photographer or at least has the right equipment to take incredible pictures for your listing.